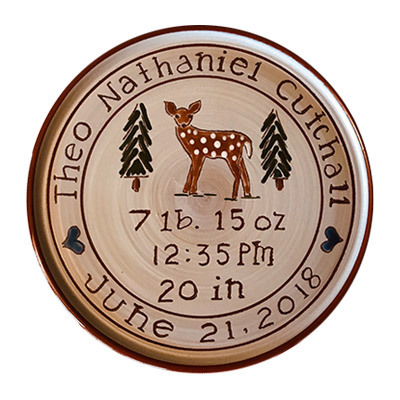 Most popular plates are for newborns but don’t forget about my logo plates, anniversary and wedding or any special occasion. 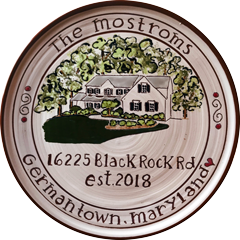 Bodmer’s Personalized Custom Pottery Plates, located in downtown Buckeystown, Maryland, is home to Nancy Bodmer’s clay studio. 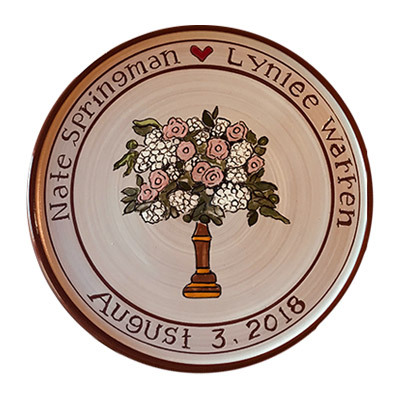 Nancy began making personalized pottery plates in 1978 and today custom designs over 400 plates a year. 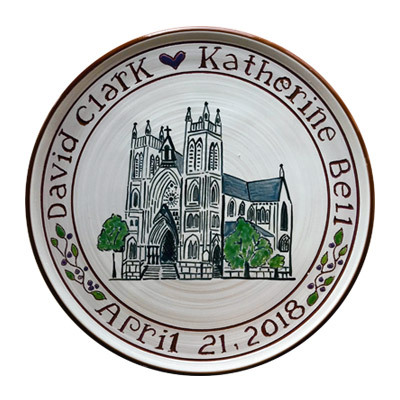 This handmade pottery makes the perfect customized pottery gift for your special occasion – weddings, anniversaries, new homes, new babies, children and adoptions, family trees, logos, life partners and your own ideas. 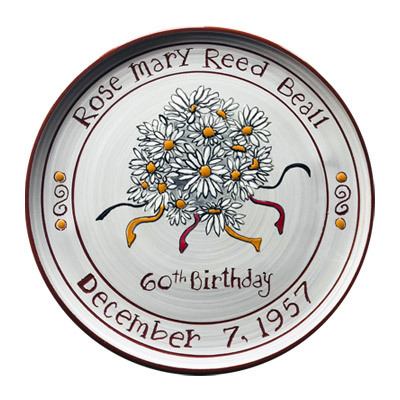 There is no showroom but appointments can be made to order, discuss and pickup commemorative plates. 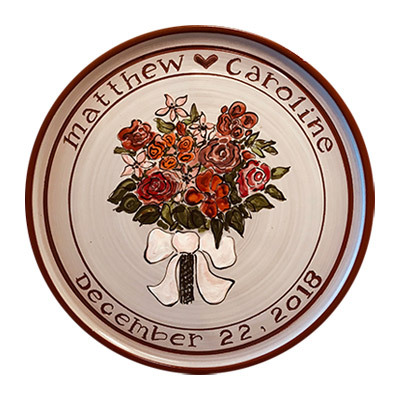 While our best sellers are Wedding & Anniversary plates and Baby plates, keep in mind that just about anything can be added to one of our plates. I think this is the first time one has drawn tears! I heard from my sister that my nephew and niece reported that they “nearly cried” when they opened their gift and saw your plate commemorating Avelino’s birth and including the representation of Beau! Thank you. I’ve always had enthusiastic responses to your plates, but I think this is the first time one has drawn tears! That passion has taken her work to Capitol Hill. 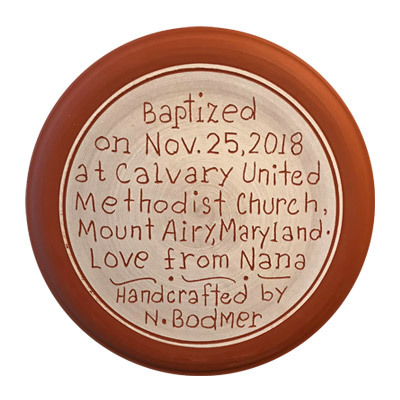 Nancy Bodmer gave her daughter the middle name Clay. 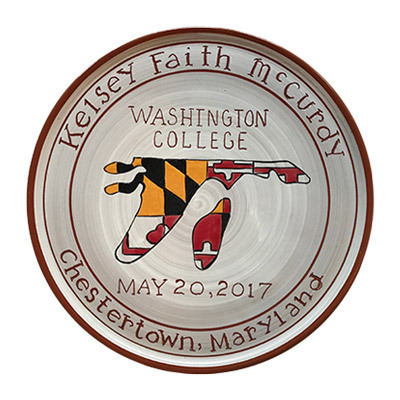 She was recently commissioned to make plates for the 42 new members of the House of Representatives, plus the seven committee chairs. 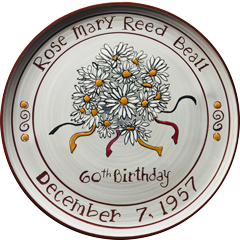 Though Bodmer said she has made “everything but the kitchen sink,” commemorative plates have become her specialty. Her first one was 36 years ago for the birth of her daughter. She said she likes the element of family and history that the plates encompass. The options for designs and messages are also appealing to Bodmer. My cousin and her husband received the plate and LOVED it!! 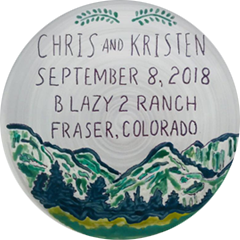 My cousin and her husband received the plate and LOVED it!! 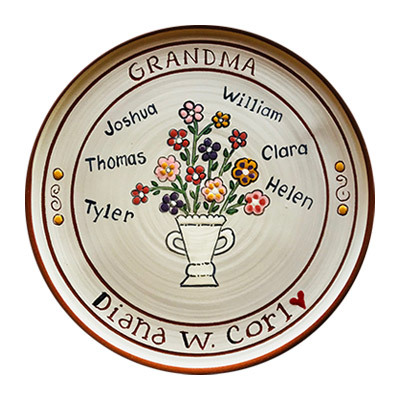 Her whole family thought it was beautiful and such a wonderful keepsake to have and cherish. 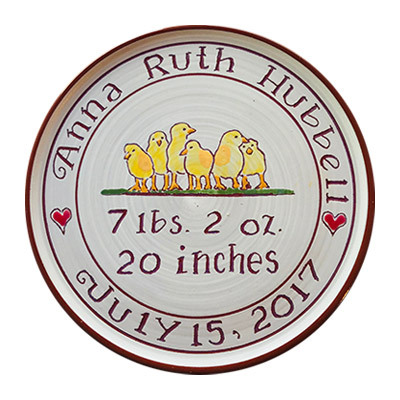 My cousin enjoys painting as a hobby so she especially appreciated all the work you put into creating the plate. I did watch your video and enjoyed learning about your process and inspiration. I definitely feel connected to you even though we’ve never met in person. And I love that your work is not only in my home but also in the homes of my close friends and family. 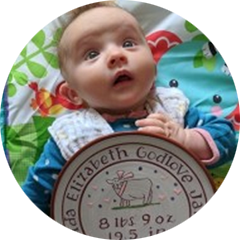 I treasure our birth plates, which hang proudly in our dining room. Thank you, Nancy, for the beautiful plate, We love it. Your beautiful plate for William was a huge success at his birthday party. I had forgotten how lovely they were and I was so thrilled I thought of you when I was thinking of a lasting gift. Thank you also for wrapping it so beautifully, your attention to detail is obvious. Thank you! I know that they will be thrilled with it. Now you can add another animal to your repetoire! I am so thankful that you have been around for all of our weddings and births and anniversaries and other celebrations. Your plates are truly unique and made with love! Absolutely beautiful pieces that you want to keep forever and ever… Makes me smile every time I walk into my living room to see my lovely piece of Bodmer pottery. Words fail! Beautiful! Like what you did front and back! You’re on our list for future events and we will recommend you to our friends. updates and specials from Nancy!